The Rovic® RV1C is our most compact and versatile three wheel cart in the Rovic range. 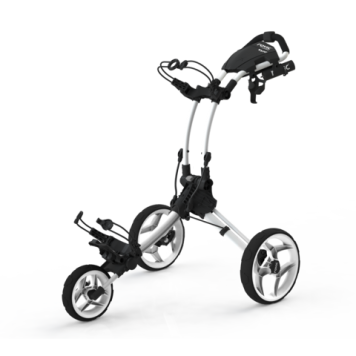 Easy to fold and a bit lighter than our other carts, it’s a great way to start walking when you play golf. The cart features solid aluminum and new plastic construction like you would expect on a Clicgear cart. The patented folding design, makes for an easy and straight forward fold. The RV1C can also fit a wide range of Clicgear accessories making it very user friendly and yet still a lower priced option. Standard handle mounted brakes and full console make it easy to use. The upper and lower saddles along with the Clicgear Easy Clip bag straps, can fit just about and stand or cart bag as well. The RV1C is a great option at a lower price without much compromise.